Categories: Guru, Mahans, Sri Muralidhara Swamiji. 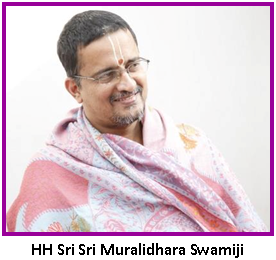 This series chronicles interesting experiences recounted by the devotees of HH Maharanyam Sri Sri Muralidhara Swamiji. These articles are translations from the series, “Madhuramaana Mahaneeyar” that is published every month in Madhuramurali Tamil monthly magazine. The original article was written by Dr. Bhagyanathanji, Personal Secretary of Sri Swamiji in September 2016 issue. 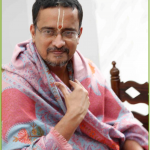 Sri Ramanaganesh is an alumni of our Madhurapuri Sandeepani Gurukula Vedapatasala. 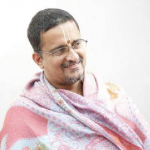 He is devoted and affectionate towards Sri Swamiji. Childlike, he knows no deceit or pretence. After completing his studies he now lives at Tiruvannamalai. A few days ago Sri Swamiji had gone to Tiruvannamalai. During his stay there Sri Swamiji suffered from severe pain in his leg. At that time Ramanaganesh desired to do ‘padaseva’ (massaging the holy feet). Sri Swamiji who was resting, permitted it. Ramanaganesh began to do padaseva. Suddenly he stopped and pulled away his hand. His fingers were bent! His face clearly reflected the fear he seemed to be gripped with! He seemed as if struck with some electric shockwave. He kept stretching his fingers and massaging them. At once, the shadow of sorrow on Ramanaganesh’s face was replaced with clarity and joy.